Looking for a fishy adventure? Well then Mako Mermaids is for you. Mako Mermaids is a Netflix original series. This TV series is about 3 young mermaids who accidentally let a land boy into the pool and he turns into a merman. I think it's very interesting. Seasons 1 & 2 are now streaming on Netflix. It all began on Mako island where Zac and his buddy Cam are camping. Cam was going to bed and Zac said he was going for a stroll. It was a full moon that night. Nixie, Lyla, and Sirena were on Moon Pool duty. Little did Zac know that there were mermaids on the island. In a mountain nearby a pathway opens up to a cave. Zac entered. Inside there was a trident shape. Zac touched it and sank in the ground down into the pool. Then the three mermaids are outcast from their pod. Sirena's sister, Aquata, tries to help by giving her a moon ring. But, being outcast is their punishment for letting a land boy in the pool. The next day Cam finds Zac on the beach. Zac tells Cam that he wants to go back home. So they go back. Then we meet Zac's girlfriend Evie. The mermaids have to find a way to make Zac a land boy again. The bad thing is that Zac tries to show Cam his powers. There are a few other locations and characters. At the Ocean Cafe, where Zac and Cam hang out a lot, there's this guy name David, who likes Serena. There is also the school where Zac, Cam, and their friends go. There is Principal Rita, who eventually helps the mermaids. So, if you want to find out what happens next go watch season 1 on Netflix. 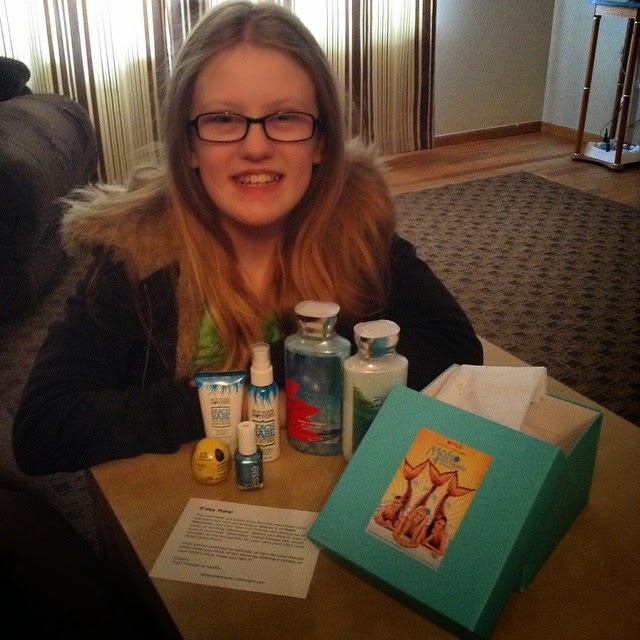 Katelyn with her Beachbox gift from Netflix. Would I recommend this tv series? I would give this show four out of five stars. The reason it loses 1 star is because some of the characters are mean and sometimes it is predictable. Personally I think Zac and Cam can be jerks to Lyla, Nixie, and Serena. My favorite mermaid is probably Serena because she sings and I like to sing, too. I really do like the theme song. Katelyn is Stephanie's 12 year old daughter. Katelyn is starting her own blog called "Little Blog for Teens".